David Navara is a chess Grandmaster living in the Czech Republic. 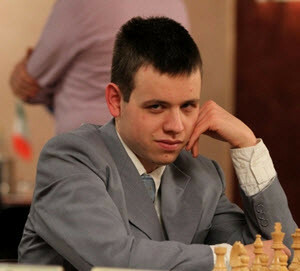 In April 2007, he became the highest ranked Czech player, with an Elo rating of 2710. At this point, he was ranked #14 in the world on the FIDE rating list. Navara’s highest Elo rating so far is 2751, attained in May 2015. David Navara studied at Univerzita Karlova (Charles University) in Prague and obtained a degree in logic. David Navara was born in Prague on March 27, 1985. Back then, Prague was a city in Czechoslovakia. Today, Prague is the capital of the Czech Republic. Young Navara was trained by Miloslav Vanka, International Master Josef Přibyl, Grandmaster Vlastimil Jansa and Grandmaster Luděk Pachman. As a youth, Navara won several world medals in youth chess competitions. In 2001, the 16 year old Navara got 7/9 in the European Team Championships. David Navara attained his Grandmaster title three days before turning 17 years old. He became the Czech Republic Chess Champion in 2004, 2005 and 2010. The first time Navara participated in the World Cup was in 2005, where he was knocked out in the first round by Predrag Nikolic. In the 37th Chess Olympics (2006), Navara got 8.5 / 12. In 2007, Navara participated in his second World Cup. He got to the second round, where he was defeated on tiebreaker by Russia’s Sergei Rublevski.